Correct. Reservations open Feb 1st and it's $140 for the campsite for a couple days. Fall break is the slow season though and they have a good shot at getting in. The weather is easier on the hike out, too. Of course the helicopter is available, too. Lol. It's not a day hike though not that anyone wants to leave immediately after arriving. If you do Devil's Bridge you might have better luck doing it during the week, as it gets VERY crowded on the weekends. Always, the earlier the better. You really can't go wrong with any hiking in Sedona, it's beautiful everywhere. You can make a loop with Soldier's Pass, Brins Mesa and Jordan Trail that is very scenic and pretty easy. West Fork Trail is also great and would be beautiful in the fall! I second Elote as a must-go - maybe go during the week, or earlier in the evening...I've waited over 2 hours before! Mariposa is more upscale, but great if you want a nicer evening. Hudson, Hillside, Creekside...lots of different options for dining. Give the family a special treat and completely free. One night drive down one of the roads off the main highway. There will probably not be another vehicle with you. Stop on side of the road and tell them to step out the car, make sure to turn off your car lights. Have them stand there in the pitch darkness and look up at the stars, just completely amazing. Good info in this thread for sure so far. Looking at these 3 tentatively for lodging. Any reviews/advice on these? Fri - GC? Not sure I want to tie up a whole day going to the GC if most of it will be spent in the car. Great stuff in here. Staying at Enchantment Resort in early May for 5 nights. Plans so far are hiking, Grand Canyon, golf at Seven Canyons/spa day for wife, and milling around town/going to some restaurants. 1) anyone ever played at Seven Canyons? How is it? 2) has anyone done the train ride from Sedona to Grand Canyon? Is it worth it? There is no train ride from Sedona to GC. You have to drive to Williams to catch the train. Williams is 30 miles west of Flagstaff. I’ve done that train ride a few times when family had visited. I liked it for certain situations(family that can’t walk around too much or young kids that will find the train fun). It really just depends on what you want. If you do the train....you only get 3-4 hours at the Grand Canyon before you have to go back to Williams. And....you can’t see the Grand Canyon from the train...there is one part where you see GC from the train for like 3 seconds and then woods block the view again. You can drive the 2 hours to GC (South Rim)from Sedona and explore on your own and have more time there. No you can do same day round trip rides. That’s all I’ve ever done (I’ve taken the train 3 times). There are several packages and different riding cars. Some people take the train and stay at one of the hotels right at the rim for a couple days before taking the train back. Sounds like we’re not really old or young enough for the train. May just end up driving. Should be a nice drive anyway, correct? Plus....you can go at your own pace and stay as long as you like at the South Rim since it’s only a 2 hour drive back. Imagine staying to see the sunset over the GC? I’ve never done it....bet it’s amazing. It’s about a 2 hour drive each way from Sedona. Not that bad. If you have never been to the GC I highly recommend going. They'll be 12 and 17, so no worries there. They're both in better shape than the wife and I are. 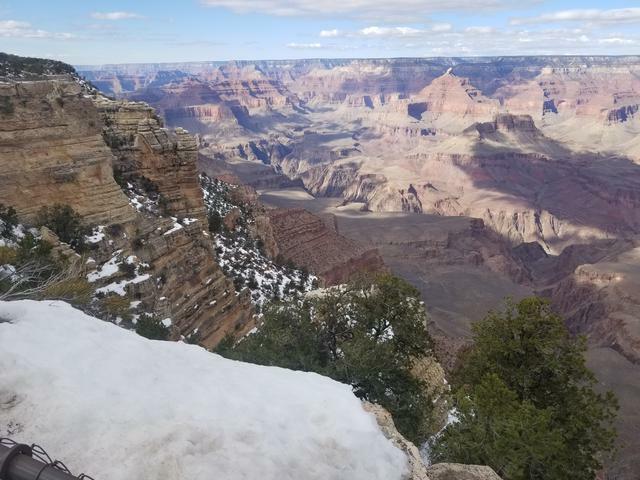 I think we've decided to make a full day of the GC and enter from the East gate, and drive down to the South rim, then find a decent hike to find some seclusion adn take in the sunset before heading back to Sedona. I never can remember, but how are the National Parks on alcohol? Wouldn't mind packing in a bottle of wine for the wife and I to have while watching the sunset, but want to be respectful of the rules. Went to Sedona and GC with kids a few years ago. Our favorite hike was Doe Mountain with our then 4 year old. We hauled him up in a backpack carrier (wasn't very much elevation gain) but once at the top it's just a huge plateau where he could run around. However, be careful around the edge. There are some great views. Pink Jeep tours were great as well. Another great hike was West Fork... follows a creek and at one point there's a large area of rocks and water the kids can play in. A guide is not necessary for the GC. Just familiarize yourself with some of the viewpoints and go. Hike down some of Bright Angel Trail... most people just go down a ways and turn around. I was at the south rim last weekend and we basically had free range of the park. Stayed at the bright angel lodge. Saw some elk and and a ring tailed cat out towards hermits nest after watching the sunrise. It was cold though, about 22 degrees with snow on the ground. Yeah I think we’re gonna go, being that we are that close. Definitely won’t be our last time in the area (or so we hope), but you never know. Ended up booking a room at the El Portal. Cool looking Boutique downtown Sedona. Have reservations at Dahl and DiLuca for dinner one night also. Will probably book a pink Jeep tour (Broken Arrow). tuzigoot nm. probably my favorite ruins that i have seen. also, cottonwood is a pretty cool town. i'm a bit of a park/monument junkie, so that's where i favor. if that's something your crew might be interested in, buy the $80 park pass that is good for almost all parks and monuments for a year. i was not impressed with the food selection at oak creek brewery, but the beer is pretty good. there's a ton of shite to see and do in the sedona/flagstaff area. even if you have no plans of doing anything north of sedona, you should make the drive to flagstaff on 89a, it's pretty incredible.